Destinations: Athirappally & Kodanad Elephant Training Center, Ezhattumukham Village. Day 1 & 2: Ezhattumukham Village, Athirappally & Kodanad Elephant Training Centre. 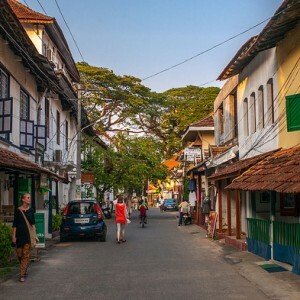 North of the Kochi has some of Kerala’s most stunning sceneries, from Ezhattumukham Village (The Face of Seven River), riverside elephant camp and breathtaking Athirappally waterfalls. On arrival at Kochi Airport/R.Station, you are greeted and whisked away to a hotel near Athirappally Waterfalls. After check in and getting refreshed, head to Kodanad Elephant Training Centre, located on the Periyar River, the centre is the home to several wild elephants brought in from the forest for training. In the morning mahouts guide the elephants down to the river for their morning scrub-down. 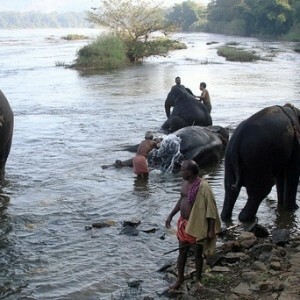 As the Periyar flows gently by, you can look on as the elephants extend their legs and trunks for the mahouts to clean. Spend some time with Elephants & their mahouts by helping mahouts in giving bath to Elephants and of course have an elephant safari as well. And if the mahouts allow you may be able to feed these giants. evening back to hotel. Kodanad Elephant Training Center: Kodanad, set on the Southern banks of the Periyar River amid the beautiful high ranges near Perumbavoor, is one of the largest elephant training centres in Kerala. Earlier elephants captured from the local forests (the forests in the East and North of Kodanad) were trained here. Since the introduction of a ban on elephant capture, Kodanad has been reduced to a training centre. The famous Malayatoor Church is near Kodanad. On day 2 after a sumptous breakfast drive to Ezhattumukham Village also called ‘The Face of Seven Rivers’ which is 15 Km.s away from the hotel. Ezhattumukham Village (The Face of Seven Rivers): Ezhattumugham is a country village in the Ernakulam district . It is situated 11.8 km from the Kochi Airport and 40 km from Kochi. The nature-friendly village is a riverside picnic spot. The scenic premises have been portrayed in many Malayalam movies. 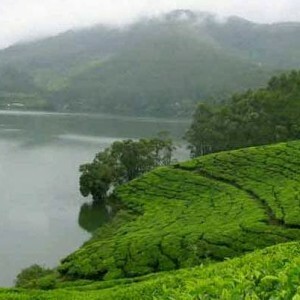 The village is located between the hills of Kumbalamudi and Karapottamudi. The sound of the gurgling river that could be heard even from a distance reminds one of a gentle waterfall. Quaint and serene Chalakudi river at Ezhattumugham gently flows around islets, boulders of all sizes and trees with mini waterfalls on the way. The scenery is enhanced by myriad shades of green. The smaller islets here are the kingdoms of wild shrubs, trees, birds and squirrels. Where the chirping and warbling of birds and the faint fragrance of spices growing all around makes for a peaceful day break. After visiting the The Face of Seven Rivers you head further north to the Athirapalli waterfalls. The journey towards the waterfall is filled Coconut trees, plantations, small streams, villages…But yet nothing prepares you for the sight of the waterfalls themselves. Their beauty, their magnificence and their endlessness overwhelms you immediately. Set back a short walk through the woods, these falls are comprised of two sets of cascades descending eighty meters to the ground. If the heat is too strong, move close enough to catch a misty shower before climbing back up to the summit. From above, take in a panoramic view of the falls as they flow into the river and out into the surrounding countryside. 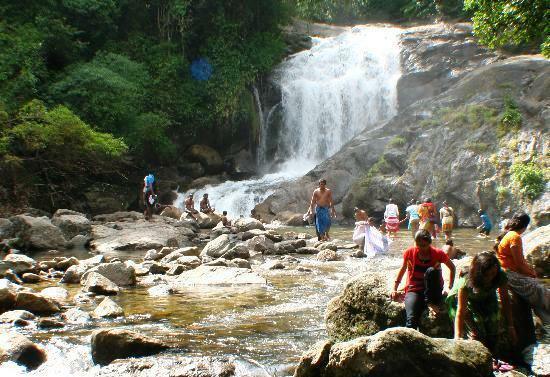 Also try to visit the Vazhachal waterfalls which is 5 K.ms away from Athirappally inside the forest. Athirappally Waterfalls: The little Niagra of Kerala, bursting forth from the jungles of Sholayar, the Chalakudi River comes crashing down, plummeting 80 feet to form the dramatic Athirappally Falls – the waterfalls as spirited and noisy as the forests are dark and silent. The cool spray that covers a large area near the falls makes this area a scenic location. Film crews, both from the north and the south India, often camp in its precincts to exploit its raw appeal. Another picturesque Vazhachal Waterfalls is 5 Km away from Athirappilly & close to dense green forests. After breakfast check out from the resort and proceed to Kochi airport/railway station. Depends on available time and your interest you spend the time. Shopping in Kochi is an interesting experience depends on the products. And on time we drop you at the desired point. Travel back home with the green and majestic experiences of your weekend.